(Inside Science) -- Clinicians who prescribe radiation to treat cancer face a fundamental difficulty in determining what dose to apply: They don’t know how individual tumors will respond to the therapy. Now, a project by researchers at the University of Arkansas and Johns Hopkins University may promise a way to detect the difference between tumors in the lung and the head and neck that react positively to the therapy, by shrinking, and those that resist it. The researchers were able to detect resistant tumors in mice, though only clinical trials can confirm whether the same approach would work in people. The project relies on an optical technique called Raman spectroscopy, which detects the ways molecules vibrate. When the researchers applied the technique to human tumors transplanted into mice, they found it identified differences in tumors’ biochemical environments that correlate with radiation susceptibility or resistance. “We aimed to study the tumors’ chemical composition and the effect of doses of radiation,” explained Ishan Barman, a mechanical engineer at Johns Hopkins in Baltimore. As a result of the study, “we see the potential for a clinical laboratory technique,” he added. 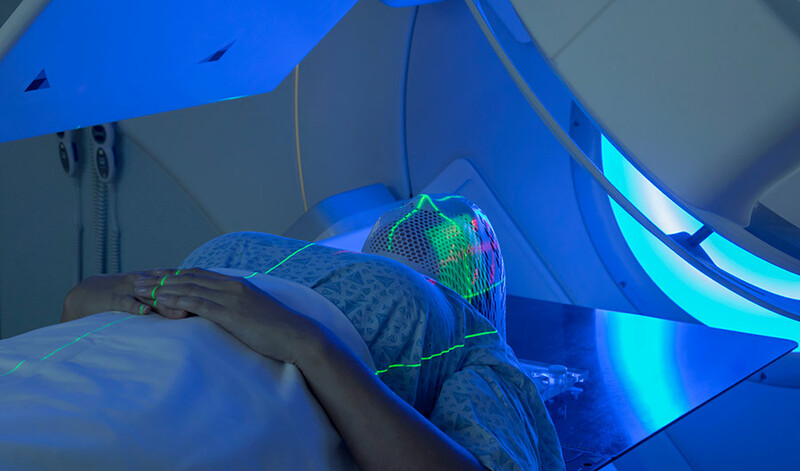 The researchers hope that the project will lead to a noninvasive means of identifying radiation-resistant tumors early in the course of treatment, if not before. That could reduce people's exposure to the toxic side effects of radiation and improve the outcomes of their therapy. Typical treatment of the solid tumors in the lungs, head or neck consists of exposing each person to frequent small doses of radiation over a period of five to seven weeks. At the end of the treatment, a CT scan or MRI may indicate whether or not the tumor has shrunk. If it hasn’t because it is radiation-resistant, the person has undergone the treatment without gaining any curative value. It’s possible to scan patients before the end of treatment, but you often have to wait at least a couple of weeks after treatment begins, said study co-author Narashimhan Rajaram, a biomedical engineer at the University of Arkansas, in Fayetteville. Not surprisingly, the idea of testing tumors for radiation sensitivity isn’t new. Researchers have explored such criteria as whether or not someone has been infected with human papilloma virus or the amount of oxygen in tumors as indicators of radiation resistance. However, those approaches have failed to show significant predictive value. Raman spectroscopy's ability to detect fine details about tumors makes it a good tool, said Barman. The technique needs only a low-power laser and doesn’t require any special preparation of samples. And it’s minimally invasive: It can potentially be introduced into the body through the mouth in a fiber-optic cable. The technique fires laser light at a target, whose molecules reflect the light back. “The wavelength tells you something about the sample you’re looking at,” Jirasek explained. The group studied tumors that Rajaram’s team grew in mice, using cell lines from radiation-sensitive and radiation-resistant lung and head and neck tumors taken from people with cancer. When Santosh Paidi, a graduate student at Johns Hopkins, applied Raman spectroscopy to the samples, he identified subtle differences between the two types of tumor. Based on those findings, the team created an algorithm to identify the difference between radiation-resistant and nonresistant tumors. Paidi then checked the algorithm by applying the Raman technique to untreated tumors. The result: The algorithm separated them into sensitive and resistant categories with a success rate of 97 percent.The team reports the findings in the journal Cancer Research. In the future, the group hopes to conduct what Barman called “a significant study with animals in vivo [that is, live] to use Raman to pick up changes in a dynamic manner” during radiation therapy. “We also want to study the effect of chemo treatment, often used in conjunction with radiation,” he said. The next stage could be the creation of an optical probe that could be attached to a needle or an endoscope to apply the Raman technique to tumors inside the body. Clinical trials will still need to prove the predictive value of such a device and also demonstrate that using it will improve patient outcomes.